The New York Times published a front-page story Wednesday on President Donald Trump's Supreme Court nominee Neil Gorsuch and his ties to a "secretive billionaire," despite never devoting equal coverage on a Democratic senator who had even more direct ties to the same tycoon. The billionaire is Philip F. Anschutz, who built an empire out of an oil and gas firm. 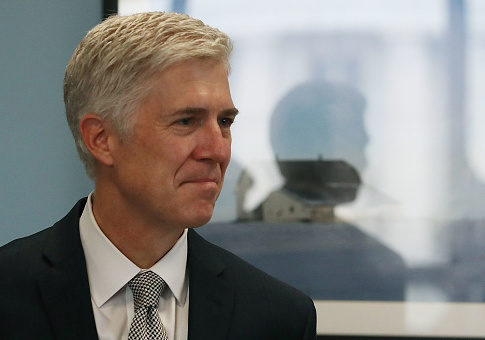 Anschutz and Gorsuch both share Colorado as a home state, and Gorsuch, whose father was a well-known Colorado Republican, was "drawn into [Anschutz's] orbit," according to the Times. The Times reports that Gorsuch represented Anschutz in several federal court cases while working for a private law firm in Washington, D.C. starting in 2004. In 2006, Anschutz sent a letter to the Bush administration recommending Gorsuch–who was then in the Justice Department–for an open federal judgeship. Gorsuch also co-owns a log cabin retreat with two Anschutz executives. But Gorsuch was never a direct employee of Anschutz or a key executive in his empire, unlike Democratic Colorado Sen. Michael Bennet. From 1997 to 2003, Bennet served as managing director of Anschutz Investment Co.
Bennet's ties to Anschutz were highlighted in 2010 by The Denver Post, which reported that "Colorado billionaire Phil Anschutz is famous for embracing conservative causes, but he also is a friend and former boss of Colorado Democratic Sen. Michael Bennet’s." The Times may be concerned over Gorsuch's "web of ties" to Anschutz, but The Denver Post noted that "executives and family members associated with Anschutz Co., Anschutz Group or Anschutz Investments donated more to Bennet… than to any other federal candidate." Bennet also has connections to The New York Times: His brother James Bennet serves as the publication's editorial director. This entry was posted in Politics and tagged Michael Bennet, Neil Gorsuch, New York Times. Bookmark the permalink.